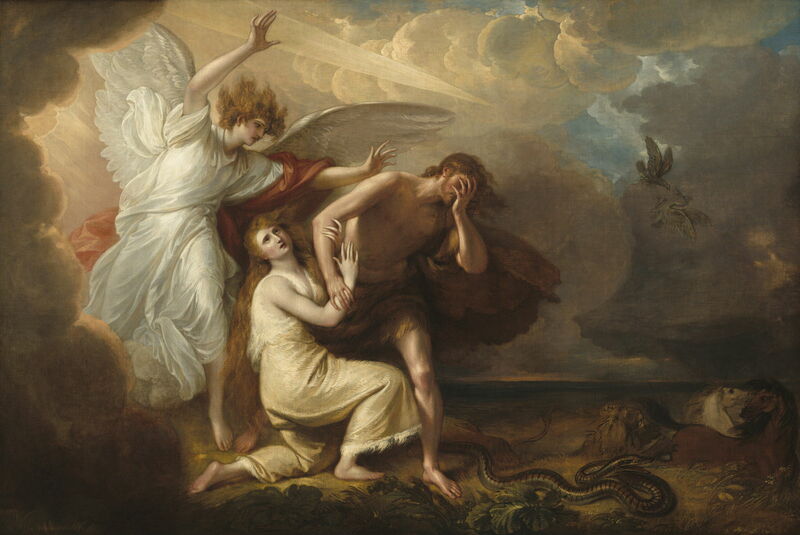 Benjamin West (1738–1820), The Expulsion of Adam and Eve from Paradise (1791), oil on canvas, 186.8 x 278.1 cm, The National Gallery of Art (Avalon Fund and Patrons' Permanent Fund), Washington, DC. Courtesy of The National Gallery of Art. Benjamin West’s ‘modern history’ painting of The Death of Chatham did not bring the acclaim which the artist had hoped for in 1778. Instead, it was John Singleton Copley, his former protegé, who stole the limelight with his version shown two years later. and many portraits. Those marked with an asterisk *, together with the Royal version of The Death of General Wolfe, were selected by the King for hanging in the Warm Room at Buckingham Palace, which the King was converting to a royal palace at the time. Another series within those commissions consisted of eight paintings showing events during the reign of King Edward III, culminating in The Institution of the Order of the Garter, which were hung in the Audience Chamber at Windsor Castle. Of the sixteen paintings identified above, none could be considered to be ‘modern history’ to compare with The Death of General Wolfe, and five were fairly traditional classical history works. Another of West’s grand Royal projects was the remodelling of the Royal Chapel at Windsor Castle as a shrine to ‘revealed religion’, which he started work on by about 1779. West apparently considered this to be his “great work”, but the King abandoned it only partially complete in 1801. At that stage, West had finished 28 of the intended cycle of 36 paintings. 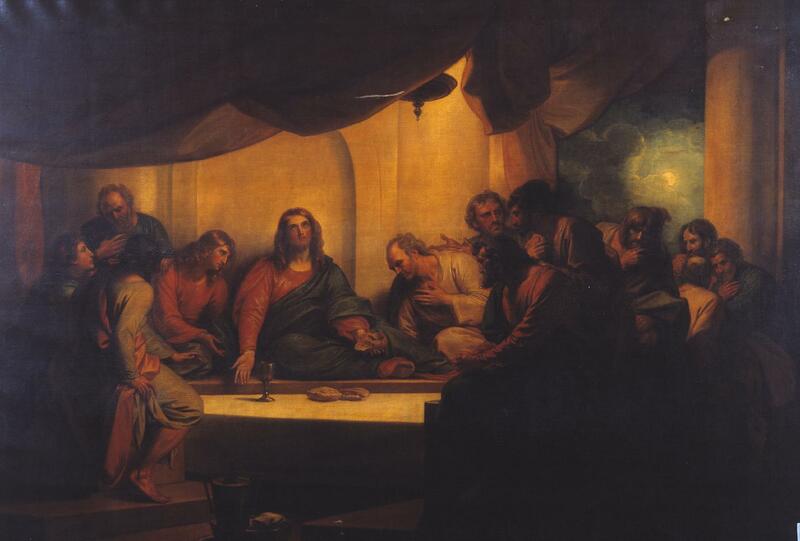 West’s painting of The Last Supper from 1784 appears something of a disappointment, certainly in comparison with those of many of the great Masters who preceded him. In avoiding a more formal composition, West has lost the cohesion of the motif, and in so doing fails to convey its profound importance to the Christian faith. 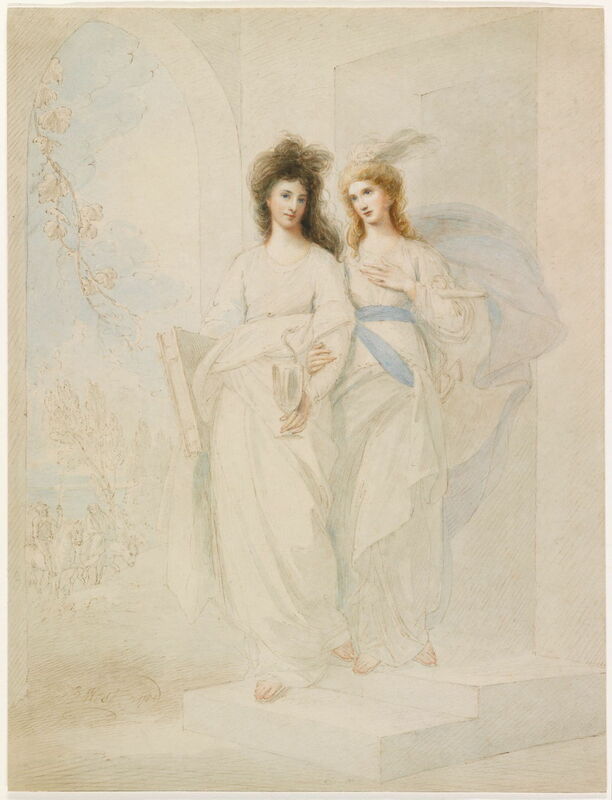 Benjamin West (1738–1820), Fidelia and Speranza (1784), watercolor and brown ink on cream laid paper, 53 x 40.3 cm, Harvard Art Museums/Fogg Museum (Bequest of Grenville L. Winthrop), Cambridge, MA. Courtesy of Harvard Art Museums/Fogg Museum. This beautiful watercolour study of Fidelia and Speranza is dated to 1784, although it would appear to have been a study for West’s earlier oil painting of Fidelia and Speranza (shown in the previous article) which is dated to 1776! 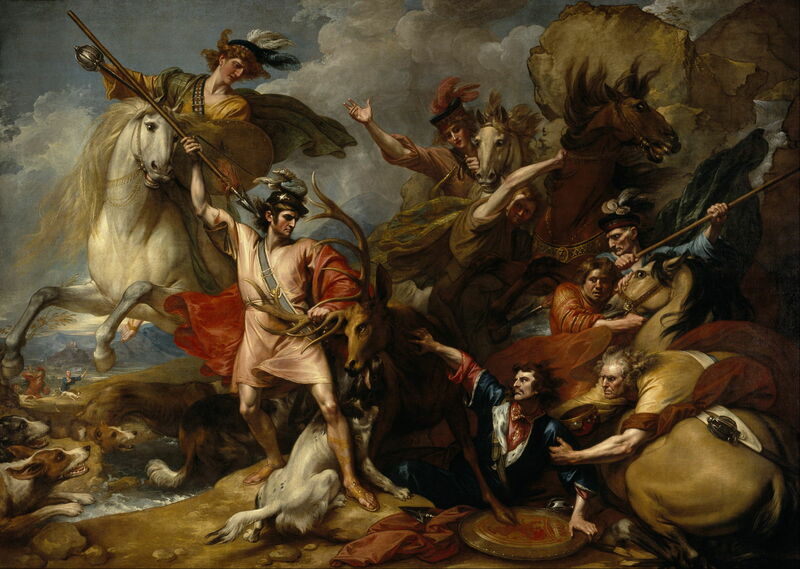 Benjamin West (1738–1820), Alexander III of Scotland Rescued from the Fury of a Stag by the Intrepidity of Colin Fitzgerald (‘The Death of the Stag’) (1786), oil on canvas, 366 x 521 cm, The National Gallery of Scotland, Edinburgh, Scotland. Wikimedia Commons. Alexander III of Scotland Rescued from the Fury of a Stag by the Intrepidity of Colin Fitzgerald, more popularly known as The Death of the Stag (1786), is a huge work showing a story from the life of this King of the Scots, who lived from 1249-1286. Unfortunately, West’s composition could again have benefited from some alterations, perhaps to have used the converging radials used by Rubens in his Hunt of Meleager and Atalanta of about 1616-20. As it is, West draws the viewer’s gaze to the figure of Colin Fitzgerald, with his spear raised and ready to kill the stag, rather than the prostrate king. Perhaps that was his intent. It is also a strange motif by which to show this king, who used great cunning to gain the Isle of Man and the Western Isles from the Norse (‘Vikings’), in the Treaty of Perth of 1266. In 1786, or thereabouts, West was commissioned to paint an altarpiece for the new chapel of the Royal Hospital for Seamen at Greenwich, which had been destroyed by fire and was rebuilt between 1779-89. His St Paul Shaking off the Viper is the sketch which he made in 1786 and exhibited the following year at the Royal Academy. It shows Saint Paul performing his first miracle, in which he survives being bitten by a snake when he was on the island of Malta. Saint Paul is shown at the apex of a crowd, the offending snake attached to his right hand. According to the account in the Acts of the Apostles, Chapter 28, it was cold and raining at the time, and the Maltese showed their hospitality by lighting a fire for Paul. As he gathered firewood, and laid it on the fire, a viper attached itself to his hand. Paul shook the snake off into the fire, and suffered no ill-effects from the bite. 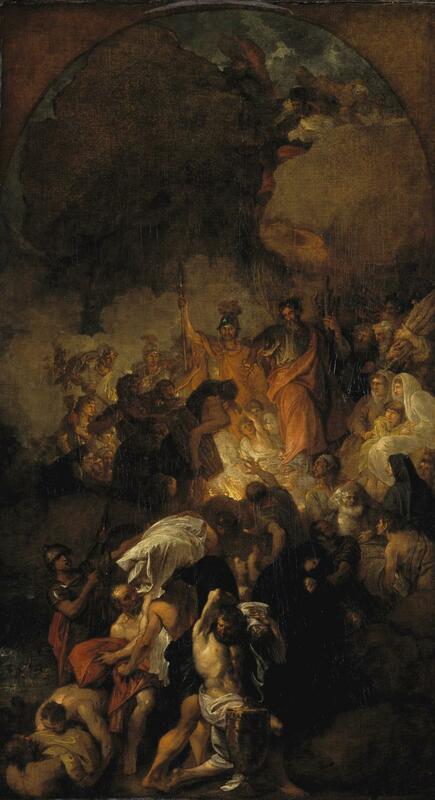 I think that West’s painting of this unusual motif succeeds, and that he has used the firelight to great dramatic effect. Benjamin West (1738–1820), The Conversion of St. Paul (c 1786), oil on canvas, 147.3 x 124.5 cm, Dallas Museum of Art, Dallas, TX. Wikimedia Commons. 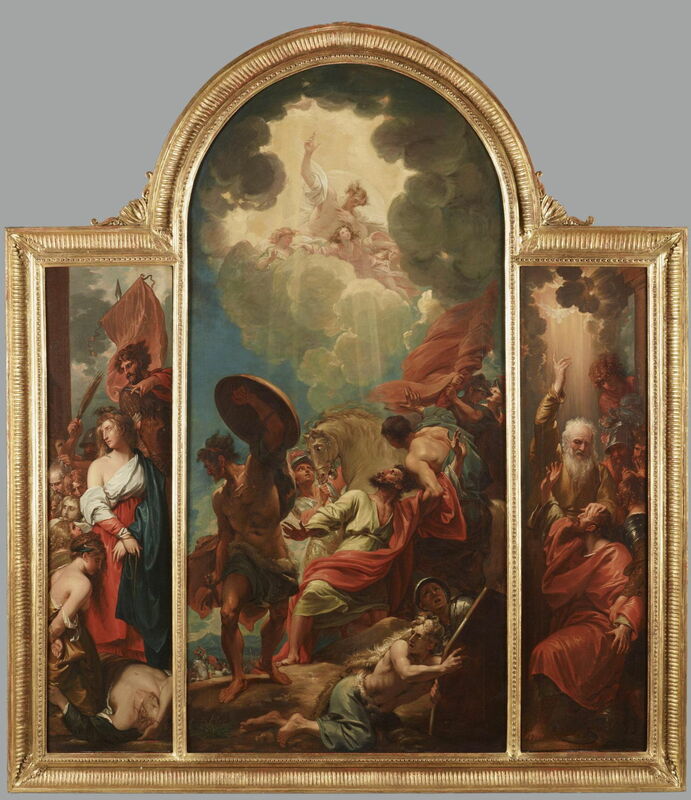 West’s triptych of The Conversion of St. Paul was painted at about the same time, in 1786. This is one of the great challenges in Christian religious painting, in the central scene showing the conversion on the road to Damascus – a subject which I examine here. There are conflicting requirements from the biblical account – of a blinding heavenly light, the road to Damascus, and Saul/Paul’s face and its expression – which are almost impossible to resolve in a conventional composition. Even Michelangelo and Caravaggio struggled to keep the narrative in their versions. West’s solution works quite well, although Saul/Paul is forced into a strained position in order for him to look up at the heavenly light and to reveal his expression. West’s 1878 sketch for the Royal commission of The Installation of the Order of the Garter is more formal, and allowed him little latitude in composition. 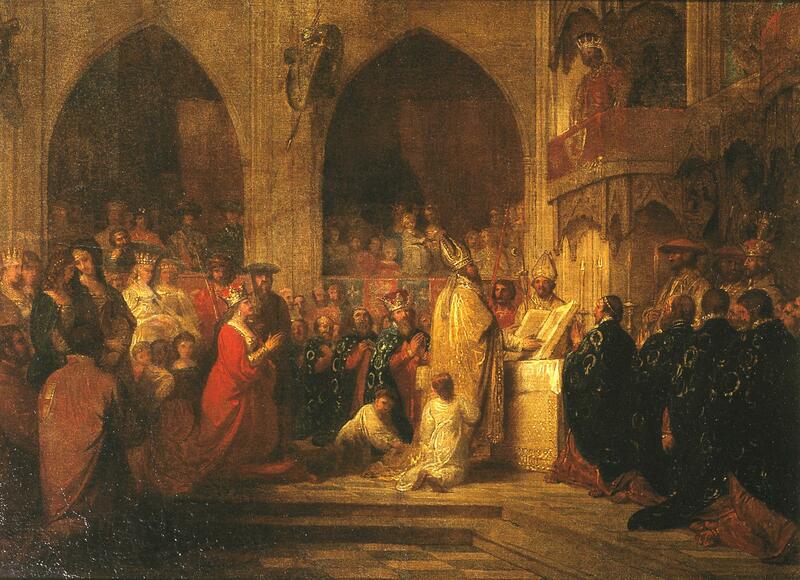 This shows the scene in Saint George’s Chapel, in Windsor Castle, at the time of the founding of the Order in 1384. The three members at the centre of the royal family each kneel in their positions around the altar: Queen Philippa of Hainault, wearing a red gown, is at the left, King Edward III, wearing a large crown, is at the far side of the altar, and the Prince of Wales is opposite him at the near side. I don’t know who the king appearing on the balcony is, though. Benjamin West (1738–1820), The Bathing Place at Ramsgate (c 1788), oil on canvas, 35.6 x 44.5 cm, Yale Center for British Art, Paul Mellon Collection, New Haven, CT. Courtesy of the Yale Center for British Art. 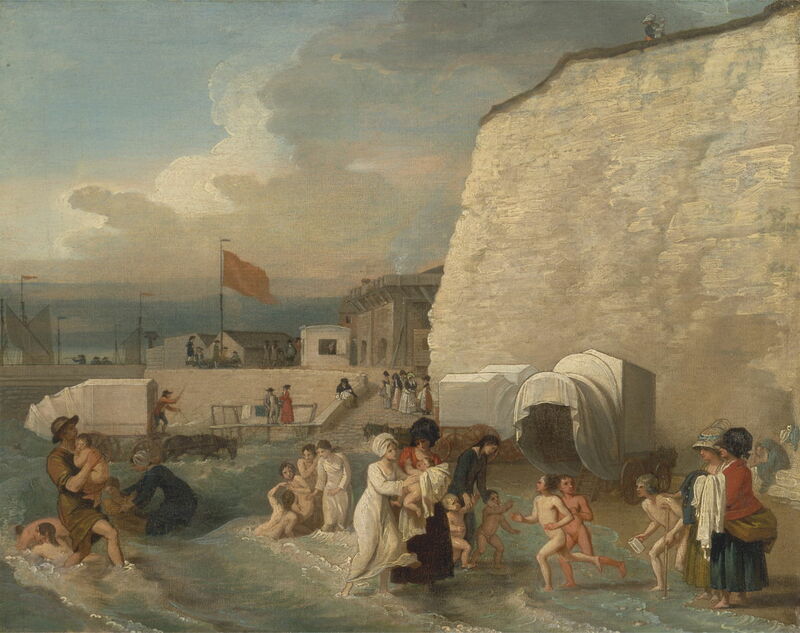 The Bathing Place at Ramsgate, from about 1788, must be West’s most out-of-genre painting. It appears to have been commissioned by William Russell Birch (1755-1834) for a collection of engravings of British landscapes, published in 1790 under the title Délices de la Grande Bretagne. Several paintings used for the engravings were by Sir Joshua Reynolds, and others were by notable painters including Gainsborough. This shows the novel experience of bathing in the sea from one of the covered horse-drawn ‘bathing machines’, at the nascent resort on the Kent coast at Ramsgate. This had been growing in popularity following its adoption by members of the royal family and nobility, despite the typical English weather seen here. Benjamin West (1738–1820), The Expulsion of Adam and Eve from Paradise (1791), oil on canvas, 186.8 x 278.1 cm, The National Gallery of Art (Avalon Fund and Patrons’ Permanent Fund), Washington, DC. Courtesy of The National Gallery of Art. The Expulsion of Adam and Eve from Paradise (1791) is one of the huge paintings which West made for the Royal Chapel at Windsor, and shows a popular motif from the book of Genesis, which is actually not described there in any explicit way. Adam and Eve, dressed in fur clothing to cover their shame, are shown being cast out by the Archangel Michael, above whom is a flaming sword of light. The serpent slithers away on its belly, a cursed creature, to eat the dust. West also includes two unusual additions to the traditional: a lion is attacking a pair of horses, and above them an eagle attacks another large bird, perhaps a swan. These exemplify the loss of harmony resulting from the ‘original sin’. West’s close-knit group of figures is enhanced by dramatic lighting effects to make this a powerful and effective depiction of this familiar motif. Posted in General, Language, Life, Painting and tagged history, myth, narrative, painting, Reynolds, West. Bookmark the permalink.